Echo Alternate One Bedroom Apartment in Atlanta 935M Apartments make upscale living in Atlanta, GA affordable and delightful. This beautiful 815 square foot apartment is ready for you and two beloved pets to move in today. 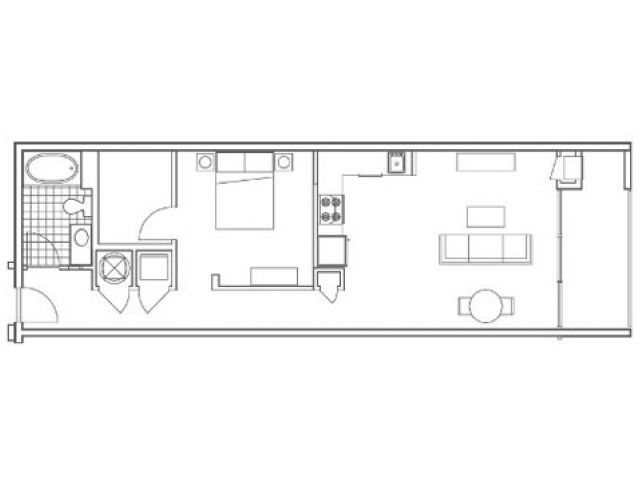 The Echo Alternate unit boasts a gourmet kitchen equipped with granite countertops and stainless-steel appliances. The 10-foot floor to ceiling windows provide gorgeous skyline views of Atlanta. Pair that with walk-in closets, in unit washer/dryer hook ups and deep-soaking tubs and you have an oasis in one of the nation’s busiest cities. 935M is pet friendly. Our policy is a one-time $250 per pet nonrefundable deposit. Monthly per rent is $25 per pet, with a maximum of 2 pets allowed. Breed restrictions apply. High-End Amenities Our pet-friendly community provides an array of on-site amenities designed to enrich your life. 935M’s yoga studio, fitness center and secure bike storage along with Torq Cycle retailers is great for those with an active lifestyle. A resort-style pool, spacious outdoor grilling area and resident’s lounge make relaxation easy and accessible. As a green property, 935M holds the Silver Certification from NAHB. We equip all our units with energy-efficient appliances and lighting fixtures, programable thermostats, and support a top-notch recycling program for our residents. To enhance our living community we have billiard, shuffleboard and a clothes care center. All this combined with 24-hour emergency maintenance for any issues your encounter with your apartments is an inclusive value. West Midtown Living 935M is close to Georgia Tech, making this living community a desirable place to live for both students and faculty. Our proximity to I-85 puts the rest of Atlanta on your doorstep. 935M boasts several popular dining options on site, like Pauley’s Crepe Bar and Le Fat. West Midtown Atlanta has a great mix of restaurants, shops, theaters and cultural options, so there is always something to do if you want a night out on the town. Schedule a Tour Today Your luxury residence is waiting for you now! Don’t hesitate to set up a tour to view our units and check out our amenities. Please call ( 866) 991-5178 schedule an appointment or to submit an application for residency.